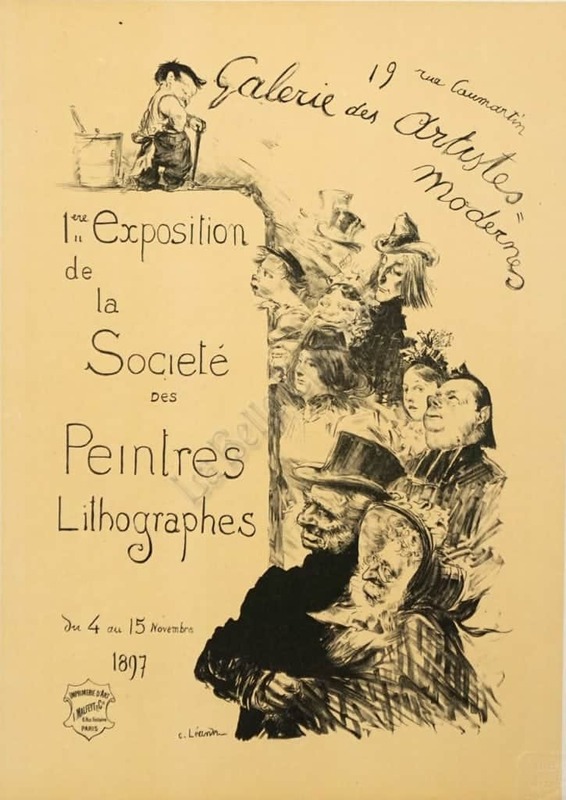 In this poster for the Gallery of Modern Artists’ First Exhibit of the society of Painters and Lithographers, Leandre’s skill as a caricaturist is seen in the portraits of a cross section of Paris types. They all appear to be looking towards the exhibition, which is being announced here. At the top the small man who looks down on the crowd, is a bill sticker (poster hanger) with his glue bucket with brush, and his poster stick in hand. Leandre is noted for his wicked wit, which was used to the utmost, as one of the earliest and most prolific contributors of drawings to “Le Rire”.